Sorry for the lack of an update yesterday. But I started writing the Terrain rules for Shooting Visibility, and then realized that I was spending a lot of time on low-level descriptions/definitions that really belonged in the basic introductory chapter. So I broke those definitions out into their own section. But since those definitions also affect the movement chapter, I ended up working on 3 sections at once! Whew! 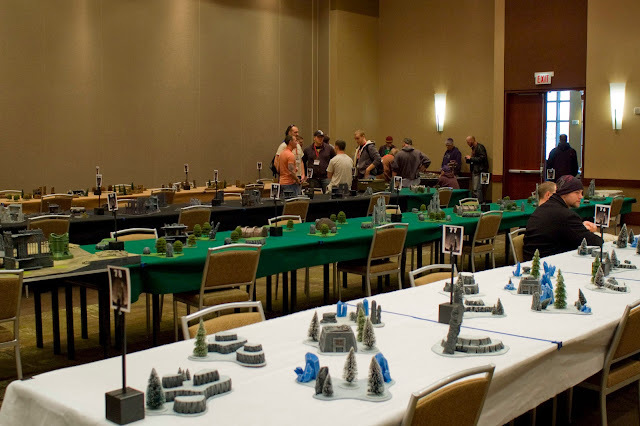 Nobody plays their Sci-Fi Wargames on an empty table (or at least nobody should). An M42 battlefield will normally be broken up by various terrain features. Such as hills, woods, and buildings. Terrain has two major effects on units. First, and most simply, terrain can limit a unit’s movement. Preventing it from running as quickly as it would like. These limitations on movement are detailed in the Movement & Terrain section of the rules. The second (and much more complex) effect of terrain, will be on a unit’s visibility to other units during shooting. When the enemy is attempting to locate and fire upon your forces. These visibility effects are detailed in the Visibility & Terrain section of the rules. There are 5 basic types of terrain in M42. The most basic type of terrain in M42 is the surface of the game table itself. Which is always considered to be Open Ground. Hills are areas of Open Ground with an elevation. They impede movement slightly for units moving onto them, and their height may affect a model’s visibility or increase their ability to see other units. Hills will often have other terrain features placed on top of them, or incorporated into their design. But these additional features are considered to be separate from the ‘Hill’ itself. Even if the additional feature can’t be removed without damaging the Hill model. The predominant feature of any piece of Area Terrain is it’s base, which defines the extent of it’s movement and visibility effects. The most common example of a piece of Area Terrain is Woods. Where the base defines the extent of the Woods’ effects on movement and visibility. While other than defining the Woods’ height, the actual tree models standing on that base are purely cosmetic, and can be moved without affecting gameplay at all. All Area Terrain affects model/unit movement identically. They differ only in their effects on a model’s visibility to other models during shooting. A Structure is any terrain feature with walls. Whether those walls are broken and crumbled, as with a Ruin. Or pristine, as with an undamaged building. The walls and floors of a structure will slow down the movement of your units considerably, and make the models on either side of them much harder to both see and hit in shooting. If Hills, Area Terrain, and Structures are the ‘big stuff’ that defines the battlefield, then Obstacles are the small stuff. Things like walls, hedges, equipment crates, and even single trees or rocks. Obstacles are broadly split into two types, Linear Obstacles, and Point Obstacles. Linear Obstacles include features like walls, hedges, creeks, fences, lines of crates, barbed wire, and other point-to-point features that may inhibit movement, or provide protection from enemy fire. But, being an inch or less in width, do not cover enough of the table to be considered Area Terrain. Point Obstacles include single features like large rocks, a stack of crates, or a couple of trees glued to a base. The maximum diameter of a point obstacle is 5”. Though most average about 3-4” at their longest point. In M42, you’ll normally set up your Hills, Structures, and Area Terrain first, before knowing what your mission is. Any Obstacles are then deployed by the players along with the rest of their armies. The number and type of Obstacles that you will be able to deploy on the table is determined by the rules of a particular mission. If you’re the Defender, you may get to put down some low walls (Linear Obstacles) to hide your troops behind. While the Attacker might get to put down some large rocks (Point Obstacles) to break up the Defender’s lines of fire and help his troops get to the objectives in one piece. This adds another interesting tactical dimension to the game and helps diminish the effects of an unlucky combination of mission and terrain. 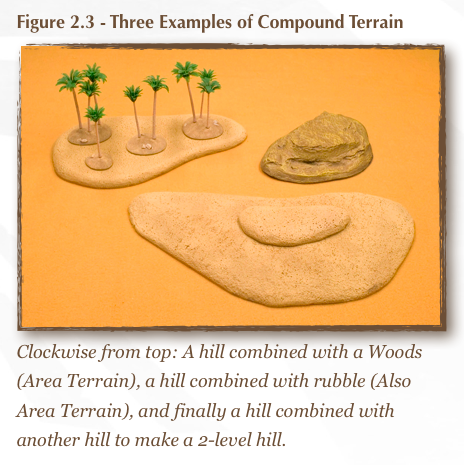 If one or more pieces of terrain have been placed on top of another piece of terrain, then the result is a piece of Compound Terrain. Hills, in particular, often tend to be combined with other pieces of terrain in this way to unique combinations of the basic terrain types.